Most men will see shaving as a chore with many skin problems. When it comes to black men, the problems of shaving turns out to be more serious. Black men have really thick facial hair. That’s one of the main reason why they have to face severe problems like ingrown hairs and skin irritations. This usually happens less to men with other ethnicity hair types. Because of these severe skin problems, black men usually have to go through various skin pains and problems. Sometimes even infections. So more than anyone else, they seriously need to choose the finest product to cope up with these hitches. That’s why they often look for a solution to deal with these skin problems. But, not everyone is the same and so you need to do a good study before you make a final purchase. Today I’ll be talking about the best shaving cream for black men and my choices for that. I’ll be reviewing each of them so that you can easily differentiate yourself to grab the most suitable one. Also, anticipate for some nitty-gritty I’ll be including, to give you a better choice-making power! Let’s start! 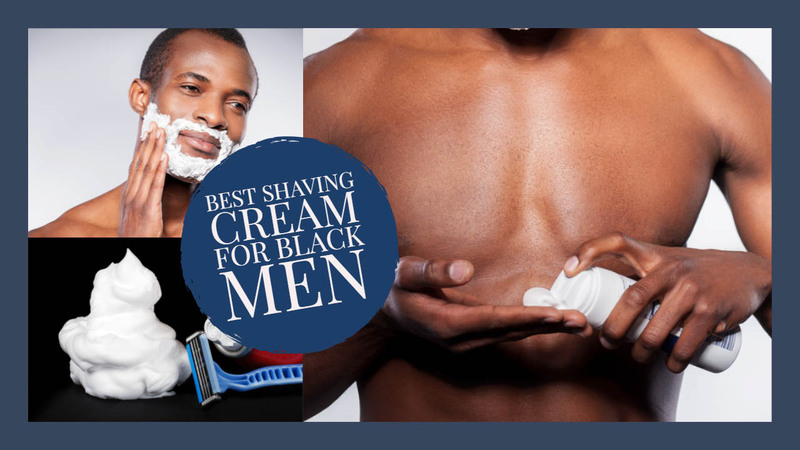 Best Shaving Creams for Black Men Comparison! There’s going to be a lot of choices available in the market. But how do you know which one is going to work the best for you? It’s easy, to be honest. You just have to use your common sense, go through well-working features, look for cons that you can deal with and finally pick a shaving cream that also suits your budget. Most of the time, men care about three basic things. First one is the amount of product they would get in one package. Since this would decide if they’ll be able to use one package for a long time or it’s going to run out quick. Depending on that the price will also make better sense. The second thing is its ingredient. Look for the key ingredients and be sure they suit your skin needs. The final feature to care about is the smell. Avoid too much fragrance and go for softer ones. Here are ten shaving creams that fulfill maximum basic criteria that every black man look for. Let’s start reviewing! 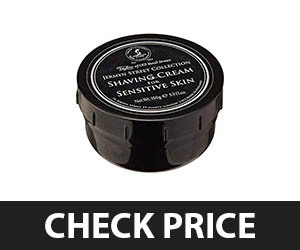 The jack black pre-electric shave is a great quality shaving cream that comes with a unique lightweight formula for most skin types. 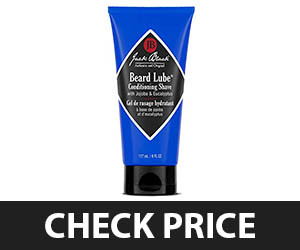 It gives you a beard lube conditioning shave that lubricates the whole hair with proper softening elements. The shaving cream includes jojoba oil and eucalyptus as the key ingredients. These elements add extra moisture to problematic skin and it is suitable for black men as well. Also, the formula is transparent which give better absorbance and safe usability. 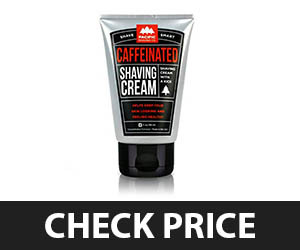 It’s a pro shaving cream that is much different from old fashioned gels and creams. It will never dry out the skin and pamper it too fullest. The scentfree cream gives better safeness. Does extra moisturizing and conditioning effect. Lathers very well and good in lubricating. A popular choice for men who loves natural ingredients. No harmful chemicals at all. It’s a bit thin in consistency that might be a problem for some men. 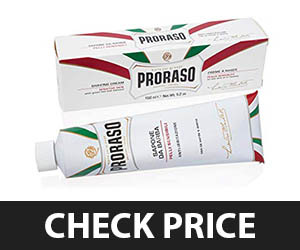 Proraso shaving cream is a great product for men with sensitive skin. The smooth feel and enrich lathering makes you feel like bliss. Also, the skin conditioning effects will stay even on post shave for hours. If I had to choose in a Proraso soap vs cream I’ll go for cream version because it gives a certain amount of hydration to skin that is very beneficial for sensitive skin men. The extra soothing and softening ingredients will keep the skin fresh and bump free. With a good amount of product, this lasts longer and gives a great amount of lathering. 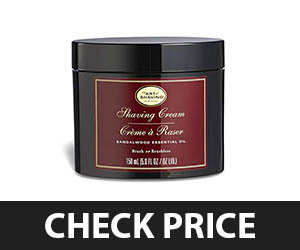 Only a dime size of cream goes a long way to get a perfect creamy shaving experience. A rich in lather shaving cream. Gives enough soothing effect to the skin. A perfect pick for men with sensitive skin. It’s better than the soap version. Not a good choice for eczema affected men. 3. 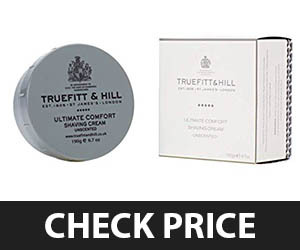 Truefitt and Hill Sandalwood Shaving Cream – For Ultimate Comfort with Closest Shave! The Truefitt & Hill shave cream is a popular choice for men with any skin type that gives a comforting shaving experience. The cream does bring extra benefits for men who have sensitive skins and are prone to rashes as well as allergy issues. Truefitt and Hill shaving cream come with lavender essential oil that works just like magic for problematic skin. The glycerin, on the other hand, helps to keep cuts and nick away with smooth blade gliding. It lathers up very well and gives a deluxe shaving feel. Gives healing effect to problematic skin. Good shaving cream for easy blade gliding. The moisturizing properties keep skin hydrated. Comes with a good amount of product. The Taylor of old bond street shaving cream is the evergreen English classic shaving product that men are falling in love with all over the world. It comes with a nice light fragrant that does not harm any skin type. Also, the tube has a good amount of product that will go a long way for you to make the money spent worth it. Most black men with sensitive and problematic skin will get extra benefits from the ingredients of this classy shaving cream. The cream comes with a re-sealable bowl and a nice brush to make your purchase a perfect combo deal. A great brand that is reliable for many years. The fragrance is harm free. No dangerous chemicals in it. Lathering is more than enough. Easy application with brush and bowl. Sometimes the blades glide a bit roughly. The art of shaving cream is a perfect choice for men who love to have a closer shave that’s safe as well. The art of shaving ingredients do the job for you giving a safe and comfortable gliding that you need for better shaving. It comes with elements that are great from skin problems such as rashes and irritations. Also, the lathering is very foamy and rich to give you a perfect wet shaving experience. This cream is a perfect product to use after you come out from the shower. It gives you the hydration and softness to get a smooth shave without cuts. No chances of cuts at all. The ingredients are super safe. Need a lot of amount of product for one use. 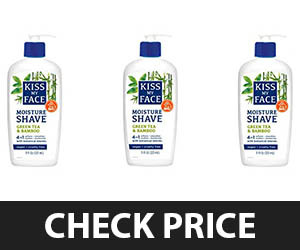 The Kiss my face shaving cream will give you a soft feel that makes it easy to glide the blade and get a perfect shaving look. It’ an excellent choice for black men with sensitive skin type. The cream comes with the double effective four in one formula. It gives a post shave feel that’s soothing, smooth and soft on the skin. The pump is very convenient and packaging is really good for carrying in a bag. The green tea and bamboo extracts work like magic with extra elements such as coconut oil and olive oil. It also comes with other beneficial ingredients for skin such as lemongrass and Aloe Vera. Comes with a lot of natural ingredients. Gives soothing and hydration to problematic black skin. A small amount dries out in the bottle mouth. 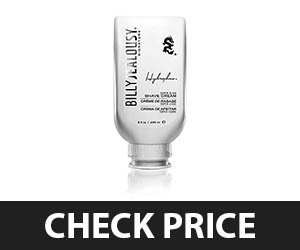 The Billy jealousy shaving cream is a unique product for men shaving that comes with a foamless technology. This hydroplane shaving cream gives you an effective clean shaving look that feels smooth and comes with no cuts. The moisturizing property of this shaving cream is one of a kind. It’s a perfect foamless blend for men who love shaving and cleansing. The product helps to give a pure foundation your face to glide the blades easily. It feels like butter is being applied on the face. Super smooth and comforting with great ingredients. It’s a good pick for men with most skin types. There’s no alcohol in it. Super comfortable on the skin. Reduces the chances of cuts. Requires only a quarter size of product for one shave. It has the consistency of lotion that some men won’t like. The Pacific shaving cream is a purely organic shaving product for men that only includes natural ingredients that are zero harmful for any skin. So no matter what type of skin you have it would do a great job to make a shaving foundation and leave baby soft skin. The cushion it provides is very luxurious for a smooth gliding shave. It gives enough moisturizing to the skin after you finish shaving. Any skin problems like rashes or irritations will get solved with this incredible shaving cream formula. There are almost zero chances for any razor burn ever. It purely soothes the skin and avoids burnings sensations that typical shaving creams most of the time has. It feels great on the skin. Leaves skin baby soft and hydrated. Bulk pricing is a problem. The Taylor of old bond street sandalwood shaving cream is a lavish shaving essential that gives you the feel of bliss while shaving. 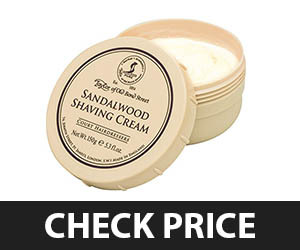 This is a sandalwood shaving cream that comes with a very light fragrance and it does not harm the skin. So men with irritating skin or other problems will have a lot of benefits from the Taylor of old bond street shaving cream sensitive skin formula. The UK made shaving cream is probably the most popular one in this list. The lathering is in one word super creamy and foams like buttermilk frosting. Most of the black men would live the plush feel they get with the extra protection it gives to the skin. It’s perfect for problematic skin. The shaving cream with the goodness of eucalyptus and rosemary extract will leave a soothing effect for skin that shows problem while shaving. 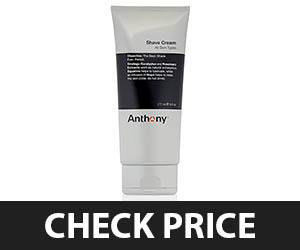 It’s a great consistency cream to give relaxation and suits almost any type of men skin. The thick and whipped formula will build lather quickly and quite easily with a great amount of foam. The blades slide very well and need absolutely no effort. Even with fast shaving, there are zero chances of cuts and thin layers also work for a nice clean shave. A perfect relaxing shaving cream for men. Spreads easily and feels nice. Comes with all natural ingredients. Softens even the hardest beard. It needs a good amount of product for one use. Two Questions before Choosing the Best Shaving Cream for Black Men! It’s easy to just grab almost anything when you don’t have much love for your skin. But if you are reading this, you are surely not the above-categorized specifics. So for you, the journey is going to be longer than usual. Start with having some thoughts about your skin. Now that you are sure to pick a shaving cream, first begin with answering some questions for yourself. Here are two major ones! Most of the men including the ones who have black skin will fall in three categories based on skin type. Sensitive, oily and dry. There are some rules for men with different skin type, especially with shaving creams. Men with sensitive skin should avoid the shaving creams that include astringent within. However, if you have a skin type that is oily, then the element isn’t harmful at all. Instead, the ingredient does great benefits like reducing oils and preventing pore clogs. For black men with dry skin, choose a shaving cream that includes glycerin base within. This element is very beneficial to avoid nicks and cuts. Because this base helps to give your face a foundation that is easy to glide the blade. What Ingredients Are You Allergenic To? There are so many men who have skin problems due to one specific ingredient. You should know about the allergenic element that is causing a problem for your skin and try to figure it out. However, there will be still some men who have absolutely no idea about the things that are causing disturbance and reactions to their skin. So here are some ingredients that most black men have problems with and sometimes is the reason for rashes and reactions. The very first one is Paraben for sure. Remember a very simple equation that goes for most men and even women. Paraben is equal to trouble! This ingredient has a connection with diseases such as allergies and asthma. So obviously it is harmful to almost everyone. Paraben is included in skin care products to avoid bacterial growth. However, there is still some product that fights bacteria even without the use of paraben. Try to look for them. SLES is an ingredient that you are going to find in a variety of skin products. This is mainly included to eliminate any side effects from petroleum-based stuff. However, the element is really dangerous to cause various side effects. The beginning would be with organ toxicity. Horrible! This is not the short form of any detective team! It’s actually a chemical known as Sodium Lauryl Sulfate. This ingredient is basically used to clean up your skin when you apply this directly on any skin. But SLS has a harmful side also. It takes away the natural oils and creates a lack of moisture. Moreover, the element also stays for up to five days on your skin which is not good at all. The Criteria to Select the Best Shaving Cream for Black Men! There are more than a few criteria to know about when the bet is one the finest shaving cream for black men. I’ll be talking about the most basic and rudimentary ones that you absolutely cannot ignore in a shaving cream. We all have our own expectations from a luxurious wet shave. Without a rich amount of lather, it’s impossible to make that happen. That’s why you need to have a good look at the feature. Remember that sometimes your water hardness is the reason why you cannot get the lathering you wish for. So before you curse on a certain shaving cream make sure your water is good enough to meet the lathering requirements. When you are choosing a shaving cream be sure to pay enough attention to the ingredients used to make the cream. These are the one that is going to have an effect on your skin. You’ll be able to find it with the features while buying. I would absolutely tell you to go for natural ingredients. There’s no good remedy than nature! It’s true and proven for the whole universe. No matter what type of skin you have, a skincare product with herbal remedies will always do well for you. A few good elements you should look for are coconut acid, water, glycerin, stearic acid, essential oils, sandalwood, green tea and so on. Always avoid synthetic materials. For example petrochemicals, alcohol, odors and colorants. These are beyond imagination harmful. These are the main reason for uneven pH balance, irritation, dryness, clogging and many other problems for black skin. Shaving creams come in three types of packaging. These are basically different in a few ways. The first one is canned type and is basically pressurized foam shaving creams. It’s the most traditional one and people nowadays have lost their affection for this type. Probably because they aren’t a perfect choice for good ingredient, comfortable and better shave. The next type comes with a brush. It needs you to have a bowl where you usually lather the cream through the included brush. These are perfect to apply directly on the face even with fingers. Finally, the brushless version. This type needs no additional tool for your application. You can directly put them on your face without any brush or bowl. What type you should choose basically depends on the method of wet shaving you prefer. Most black men will tell you their good experience with brushless ones. Actually, you can go for anyone that sounds good for your shaving style. Each of them is comfortable and well enough to give you a better lathering if the other features stay on point. Most things in life need you to pay a certain price. Especially the ones that are great. I’m sure you know that the quality most of the time depends on the quantity of money. It’s 90% true! In the real world, most quality products will need a costly manufacturing process. These goods are no joke and so you have to pay a valuable amount to get a valuable benefit. As simple as that! The same thing goes for wet shaving. If you want to have a luxurious feel on your face, don’t go for a cheaper alternative just because it saves a couple of dollars. However, this does not mean there’s no affordability for wet shaving. In fact, most shaving creams come with a very reasonable price. Manufacturers have turned out smart and now they care about customer satisfaction. So most of them are going to make an effort to leave a smile on your face. But still, do check the aspects of a particular cream you are going to get. I’m sure you’ll realize yourself if the deal is worth your money! The Ultimate Comfort Shaving: Shaving Cream vs. Shaving Soap? Both of these shaving products are actually gonna do the same thing for you. But still, they are different. How? We are about to know. No matter if you are pro shaver with lots of experience or just a newcomer to this comfortable wet shaving saga, it’s really important to understand the difference. What would give you the ultimate result that you are looking for and how that thing is going to help, depends on knowing about the dissimilarity. So here we are, starting to look into both about shaving soaps and creams with a closer look. Shaving soap is a product for old schooler. It’s been literally hundreds of years that people have loved the traditional wet shaving method using shaving soaps. It comes in a hard pluck or disc which is for sure the most notable difference from the cream version. These shaving soaps are intended to use in a bowl or container. You would have to add the required amount of water and then lather it up pretty good. A shaving brush is a tool that helps you to do so. People mostly use the brush that they use for applying the lather to their face. Most pro shavers would love to use a triple-milled type of shaving soap. These take a good amount of time to lather up well. But once it does, it really gives you the incredible rich lather that is a totally blissful experience for the face. Another excellent part of this shaving product is that it lasts a pretty good number of days. So money is being saved! New shavers who are more into wet shaving would love the experience from a shaving soap. However, they need to catch the learning curve properly. It’s going to be a bit of hazard for them at first to lather up properly. That’s the reason why most western youngsters will prefer to not go for a shaving soap. I’m not saying it’s totally worthless. But this is going to be a bit different grooming method for sure. The creams are around for years since the 1940s. It’s still a modernize way that brings enrich amount of lathering. Most conventional style shaving creams will come in an aerosol can packaging. You need to push a button and the creamy thing is going to pop out. Directly apply this into your face with your finger or brush whatever you find easy. You can also swirl it around in a bowl to get a fast lather. However, nowadays some shaving cream comes in jars as well as tubes. These are really thick and probably much more than the ones that come in a can. It might take some moment to lather these creams. However, these shaving creams have more consistency of natural elements. Such as Shea butter and cocoa which are very good to protect problematic black skin type. I want to be a bit more detailed to declare a winner! You’re going to have a heavenly experience with both methods. That’s for sure! But it actually varies with some point that might be a pro for one person and a con for another. If we think in that way, the judge for the topic is going to be YOU! You need to figure out what works well for your skin. For me, shaving creams will be more preferable. I know it’s a bit expensive than the soap version. It might be a problem for people looking into cheaper alternatives. I totally understand and respect their vision. If you are okay with investing huge amount of time to get a perfect lather and it does not harm your lifestyle than undoubtedly go for a good quality shaving soap. Most enthusiasts, in fact, would actually say that shaving soaps are good stuff for better lubricating and cushioning. But, since I’m a fan of comfort, I prefer a product that would give me a better lather. I lead a very hectic life! But I still don’t want to miss the occasion of a perfectly lathered wet. Even when I don’t have much time. That’s the thing only shaving creams gave to me. Also because we are talking about problematic skin, we need something that comes without harmful fragrances and ingredients. It’s a myth that shaving soaps don’t come in scents. Actually, even the most unscented version would have a bit of fragrance in it. But shaving creams are available with ingredients that are quite beneficial for sensitive skins that black men have. The same goes for scents. I also find it a bit irritating about the process of adding water and practicing to have the perfect consistency with shaving soaps. But if you find it not a big hassle then definitely go for it. In short, I have a soft spot for shaving creams because of some obvious reasons but I also agree that both are good in their own way. Are You Sure the Fragrance Will Not Be A Problem? Everybody likes stuff with a nice smell. There’s no debate here and we all have our different preferences to choose scents and fragrances for no matter what skincare product we use. The thing is the same for men as well. There are quite a few brands that offer really good smelling shaving creams. We got it! But hang there and think for a moment! Are you sure your skin will be just fine with those additional elements of fragrance ingredients? Do you know, in reality, scents are actually not good for skin at all? These preservatives carry a lot of negative impact on the skin. So as a man with skin problems, it might need you to be more concerned to find out if your skin would be fine after using such fragranced shaving cream. However, there are still some ingredients that actually does not harm your skin. Here I’ll be putting some points on mentioning a few of them. If your skin is more prone to soreness or razor burns, choose scentless shaving cream. However, if you cannot absolutely stay without some fragrances, you may try lavender or rose oil scents. For men who struggle a lot with cuts and nicks can choose lime fragrance shaving cream. Also bergamot oil and lemon will be a good choice. If your skin is very prone to breakout problems then choose something that has cleaning properties in it. For example, a shaving cream that smells of sandalwood, peppermint or cedarwood will be a great choice for such skins. These are some fragrances you can choose for problematic skin type. However, if your skin isn’t so much damaging because of scent and you can be assured of that fact, go for your favorite smells. Most manly shaving enthusiasts would buy something that smells very fresh. If you are one of them then try menthol or eucalyptus shaving creams. These also give a cooling sensation that makes your shaving a blissful event. Also, remember to choose a shaving cream that avoids synthetic smells. Go for the ones that use essential oil or natural extracts. These creams are most of the time totally safe for any kind of skin. 1. What type of aftershave should I use? Most of the men would just go with anything as an aftershave without giving much importance to the ingredients. Please don’t do such mistakes! Look well through the elements in an aftershave product and see if there’s something that might irritate your skin. Most men have problems with an aftershave that uses alcohol in it. These alcohol-based aftershaves claim to be anti-bacterial. However, they dry out skins and tightens it hard. This is sometimes the reason behind breakout and dryness. Instead of alcohol-based aftershave, go for the ones that have soothing natural elements. For example use something that includes hyaluronic acid, Aloe Vera and coconut. 2. How often should I shave if I suffer from severe irritation? There are some black men who go through very serious and extreme skin irritation. If you are one of them please try to shave less frequently. At least try to shave every other day rather than shaving regularly. This way you would gradually see improvements with ingrown hairs. Also, it helps with reducing shaving bumps. I’m not saying you’ll magically have baby soft skin after trying this. However, there definitely would be noticeable improvements and also your skin would feel as well as look much better. 3. What type of razor should I use? Many manufacturers of razor would promote their newly launched multi-blade contraptions with a tagline that these can give you a closer shave. Most men would love the fact and jump to get one. But if you have irritating skin, I don’t think you should use these razors at all. They are mainly the reason behind ingrown hairs and other disturbing post-shave glitches. Simply choose a razor with a single blade. A safety razor would be a good choice. 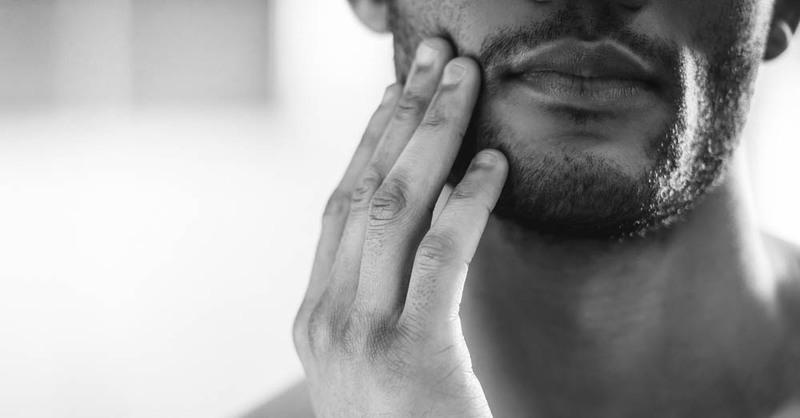 Most of the doctors and skin specialists discourage to use these for men who have razor bumps and other skin problems. In short, the closest shave you get, the better the chances of getting a razor bump. With so many excellent choices available in the market, finding the best shaving cream for black men might be challenging for you. But it’s not impossible though! If you try to be better ready with proper research and decision making ability then it’s actually quite simple. The ten shaving creams I included are greatly beneficial for men with black skin. Just make sure to go through their pros and cons. You’ll be able to realize real soon which one is the best suitable for you. If I had to choose one it would be the Taylor of Old Bond Street Sandalwood Shaving Cream Bowl. I find it a better shaving cream that gives me the lathering luxury I need with some good pampering to my problematic skin that leaves a baby soft effect. However, just don’t settle with the fact that I chose this one shaving cream. You need to look over your needs and preferences as well. Only then, make a choice! Look for some key features that you are interested in, find out what major difficulties you face with your skin, know more about each product and finally, you’ll get what you need. I hope my guide was helpful. May the bumps and irritations say goodbye to your skin forever and you get your perfect shaving cream soon. Good Luck! Lee Russell Spent several months getting to know human fashion.At the same time a responsible writer by day and a reader by night.He is aimed to provide useful information that help you enhance your personality.